★DURABLE MATERIAL, HEAT RESISTANT AND DISHWASHER SAFE: Our Tongs are manufactured from premium 100% food grade stainless steel and anti-slip plastic silicone ring handles, 100% BPA Free, non-odor and non-toxic, heat Resistant and dishwasher safe. Ensure safe and long-term service..
★COMFORTABLE GRIP, EASY ON YOUR HANDS: Plastic and silicone allows the product to fit your grip perfectly and gives the product a non-slip feeling. The handles have smooth edges for a pleasant touch which make you forget about overly-tight springs that tire your thumbs..
★NEW UPGRADE: We had upgraded the tongs comprehensively, which are manufactured from 100% premium stainless steel and designed as rivet lever structure. The unique steel tipped head grabs the full length of the tips for a better grip, even the most difficult of grilled foods..
★MULTI-PURPOSE USAGES: Suitable for taking vegetable, food, meet, cheese, bread, ice and more, lightweight and convenient, easy to carry at any place, great for various kitchen or outdoor activities..
★100% SATISFACTION GUARANTEE: We offer a full refund or replacement if you're not 100% satisfied with your purchase..
Quality silicone and stainless Steel: high quality stainless Steel and food grade pure Silicone. Durable, firm, even after years Of Use. Heat resistant up to 480° F.
Hanging loop and locking mechanism: they can be Adjusted to different width and ideal for storage, just close them together, pull the lock and store them in your drawer or hang them while using minimum space. Ergonomic design handle: Non-slip, ergonomic and firm grip design handle, easy control and pick things, easy to handle and provide maximum grip. 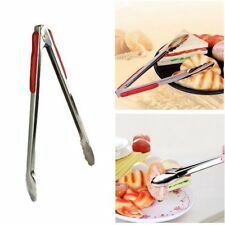 Perfect kitchen tongs: for cooking, serving, catering, barbecue, buffet, salad, Ice, oven use. The tongs Set meets most of our needs in daily life. Best choice as a present to our family and friends. 100% money back guarantee: We strive to serve you best. This is our top priority. So refresh your kitchen with this risk free purchase. 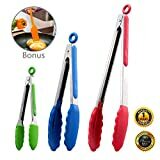 Heat resistant up to 500 degrees F..
Non-stick, Corrosion resistant and Odor resistant..
Hygienic silicone tongs BPA-free and FDA approved.. 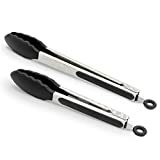 Premium 304 stainless steel construction with locking clip..
Non-slip Surface design offer you a excellent control on food..
Hygienic and Safe Silicone tipped tongs are safe to use with all your nonstick cookware. And BPA-free and FDA approved can let you enjoy your food without worrying about the health effects. Hold the Food Firmly The Non-slip head design to the tongs let them perfect for holding the food. It's soft handle grips easy to control and let your hands feel comfortable anytime. Characteristic: BPA Free and FDA Grade With locking clip Resistant to Corrosion and Odor Non-slip Surface design Dishwasher safe Non-stick Hygiene and Ergonomically Heat-resistant up 500°F Color: Black Package Include: Black Large Tong: 12" Black Mini Tong: 9" We specialize in the manufacture and sale of high quality items. Do not wait, Choosing us, you deserve the best! Description:100% brand new & high qualityConvenient to use to pick up various food in the buffet,bar or even parties.With a lock design, it is convenient for storing after using.Ideal for any kitchen. Easy to clean. Use for lifting out hot or cold food.Specifications：Size: 9.84 x 2.6 X 2.6 inch (25 x 6.5 x 6.5cm)Material: stainless steelPackage Included:1 x clipNotes:1. Due to the difference between different monitors,the picture may not reflect the actual color of the item. We guarantee the style is the same as shown in the pictures.2. Due to the manual measurement and different measurement methods, please allow 1-5mm deviation. Thanks! FOOD LEVEL STAINLESS STEEL: The heavy duty Hotec kitchen tongs built with stainless steel, sturdy, heat resistance, anti-rust, anti-corrosion, light weight, easy to handle, like new forever. 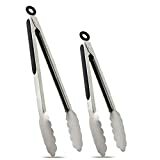 This tongs for cooking comes with a set of 2, standard 9" serving tongs and large sized 12" BBQ grill tongs.. 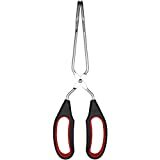 PULL RING LOCK AND UNLOCK AND HANGING LOOP: This kitchen tongs set has locking mechanism, pull the ring for lock and push for unlock, super easy operation. Hang them with the hanging loop after use or put in the drawer by pulling the ring to lock it, space saving..
ERGONOMIC HANDLE DESIGN AND HEAT RESISTANT: The handle is cushioned with silicon, good for thumb rest and ensures good grip and control. 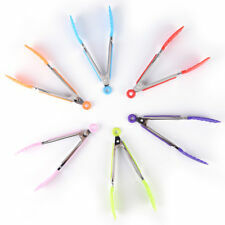 The metal tong head is super heat resistant. Easy to rinse, dishwasher safe..
ENGINEERING FOR SAFETY: 2017 new design pattern for the handle, better protects your hands from cutting by the edge when you grip the handle. Easy to control the handle and to eliminate wobbling & any risk of burning your hands. 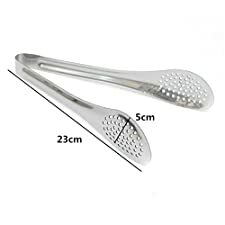 MULTIPLE APPLICATIONS: Basic kitchen utensil, perfect for indoor or outdoor use, great for daily kitchen tasks, grilling corn, flipping burgers/fish, cutting roast meat, or used as BBQ turner or salad server and much more.. DISCOVER A NEW AND EXCITING WAY TO COOK - Ergonomically crafted just for you, our tongs are designed to relieve stress on your hands, allowing you to cook with newfound confidence in the kitchen!. YOU DESERVE TO BE TREATED LIKE ROYALTY - A truly beautiful design crafted using ultra-high quality, rust-free, stainless steel with an ergonomic handle that will serve you faithfully for many years.. BECOME A CHAMPION IN THE KITCHEN - Whether you're flipping burgers at a BBQ or grilling your world famous steak, you will AMAZE everyone as you masterfully use our stunning tongs like a professional!. SAVE A LIFE! - With every purchase, we partner with World Concern to cure 1 precious child of deadly diseases in countries like Ghana. As of Aug 2018, 21,968 children have been SAVED thanks to you!. 100% CUSTOMER SATISFACTION GUARANTEE - If you have any issues with our product, simply return it for a 100% refund -- no questions asked. Your satisfaction is our #1 priority. We love our beautifully crafted kitchen tongs and we're sure you will too! Material: high quality nylon + stainless steelColor: greenSize: 26 * 5.5 cmPackage: 1 * Kitchen tongsDescriptions:Food Tongs Stainless Steel Plastic BBQ Clips Salad Bread Serving Tongs Kitchen AccessoriesUniversal pliers made of stainless steel can be used as kitchen and barbecue pliers, they won't scratch the coated pan or pan.The silicone tip is heat resistant up to 480 degrees and is non-slip and strong. It does not scratch the pan and is very safe to use.